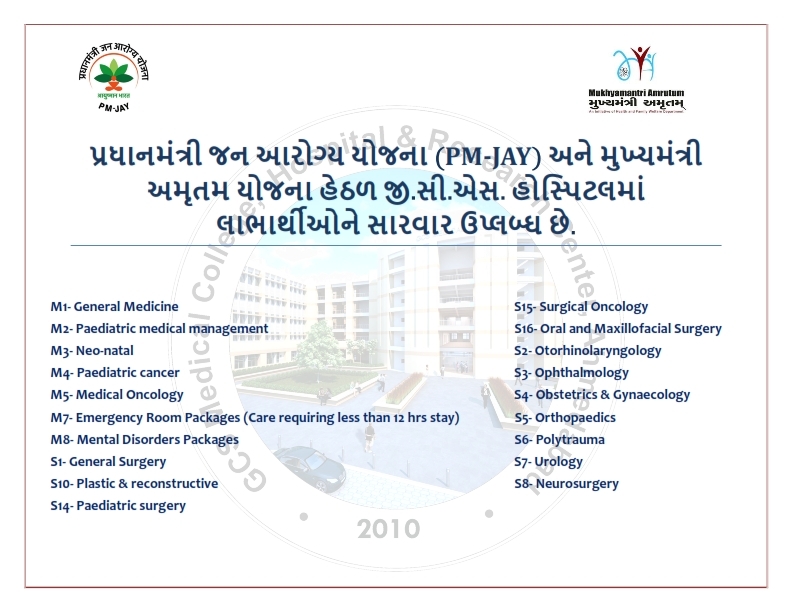 In year 2009, GCS has established GCS Medical College, Hospital & Research Centre, with state-of-the art infrastructure and facilities in 25 acres of land at the New Swadeshi Mill Compound, Naroda Road, Asarwa, Ahmedabad. GCS has tremendous record of capabilities in health care, education, research and community services. Our expertise prompted Gujarat Government to invite us to start a healthcare facility to serve the under-privileged citizens at affordable cost and create a stream of trained medical professionals. Government of Gujarat had given 25 acres of land and at present MCI had given permission for 150 students' admission in MBBS course annually. Government has given 25 acres of land on Naroda Road in the year 2009 and Society has established a general hospital of 750 beds and medical college with initial approval from Medical Council of India and Gujarat University for 150 undergraduate medical students. To be a premier medical college and State-of-the-art multispecialty hospital, world class research facilities with compassionate team of doctors and staff. To offer medical education and create a continuous stream of trained medical professionals to provide diagnostic, therapeutic and preventive helthcare to the patients at an affordable cost. We GCS members,hold the values and act according to these values. NABH is a constituent board of Quality Council of India, established to set up benchmark of progress for Healthcare industry of India. The board is structured to cater to the much desired needs of the consumers and to set benchmarks for progress of health industry. 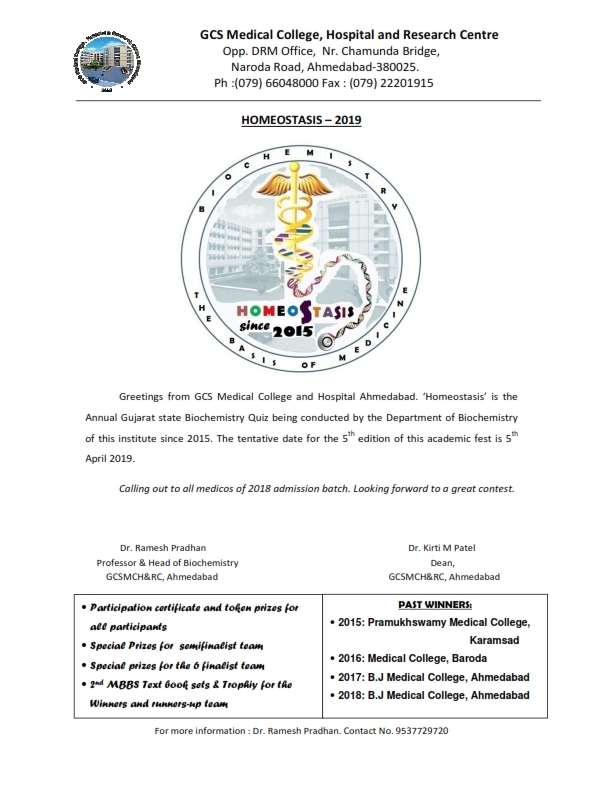 GCS Medical College, Hospital & Research Centre is accredited by NABH for Pre-Entry Level Accreditation NABH, which is 2nd in Gujarat in Private Teaching Hospital Category with largest bed strength. Commitment to create a culture of quality, patient safety , efficiency and accountability toward patient care. Establishment of protocols and policies as per National/International Standards for patient care, medication management, consent process, patient safety, clinical outcomes, medical records, infection control and staffing. Patients are treated with respect, dignity and courtesy at all times. Patient are involved in care planning and decision making. Patient are treated by qualified and trained staff. Feedback from patients is sought and complaints are addressed. Transparency in billing and availability of tariff list. Commitment to prevent adverse event that may occur.